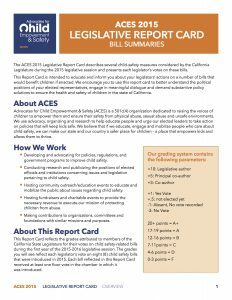 CJE’s affiliate Advocates for Child Empowerment and Safety (ACES) just released the inaugural ACES 2015 Legislative Report Card. This report card describes several child-safety measures considered by the California Legislature during the 2015 legislative session, and it grades legislators on their leadership and votes to keep California children safe. Our 2015 champions are Senators Jim Beall, Ricardo Lara and Bob Wiekowski and Assembly members Richard Bloom, Chris Holden and Brian Maienschein. These are our top legislators who took leadership to author and vote for bills to protect California kids. We want to publicly honor them for their work to make children’s lives safer and allow them to thrive. Check out their website at www.acesforkids.org.